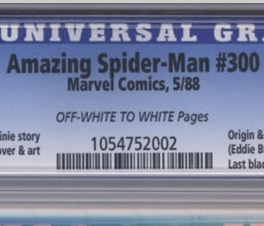 Every collector of CGC graded comics is familiar with the information panel—typically referred to as the label—located at the top of each slabbed book. The most important part is of course the grade, ranging from 0.5 to 10. In addition to the grade, other details that could impact the value of the book such as spine tears, ripped pages, and inserts are also noted. Above the unique serial number assigned to each book is the page color. A book with white pages ranks at the top of the color scale. Below the white rank, books receive ratings of off-white to white, off-white, a mix of tan and cream colors, and then at the bottom are the extreme cases of dark tan or brittle pages. Brittle pages are typically found in early Golden Age titles that sat in someone’s garage for several decades before being unearthed. While it’s clear that big page tears or missing pages detract from the value of the book, the impact to value due to page color is not as obvious. One would think that page colour does matter. Why highlight it on the label if it doesn’t? Clearly brittle or tan pages are extreme cases. But what about the three most common non-white grades: off-white to white, off-white, and cream to off-white? How can we test this? First we can simply look at some historical transactions. If page colour does matter, then we should find that the non-white page colors consistently fall below the median value of all transactions. I have chosen a random mix of frequently traded books at various grades. A transaction with white pages is denoted with a white marker. Light grey markers denote off-white to white pages, medium grey highlights off-white pages, and dark grey markers represents cream to off-white pages. The charts are below. Amazing Spider-Man #238. Verdict: Since 2008, books with off-white to white pages have consistently been below the median. But note that the second highest sale had off-white to white pages. Iron Man #1. Verdict: A book with off-white pages sold for the second highest price since 2011, above two books with better off-white to white pages. Amazing Spider-Man #129. Verdict: Four books with white pages fall below the median value. Three books with off-white to white pages received three of the four highest values. A book with Cream to off-white ranked the lowest. Incredible Hulk #181. Verdict: Books with white pages clearly did not receive the highest values. A book with cream to off-white fell below the median. Wolverine Limited Series #1. Verdict: A book with off-white to white pages sold for the highest value. A book with cream to off-white sold for the third lowest value, with an off-white and off-white to white selling at the two lowest values. 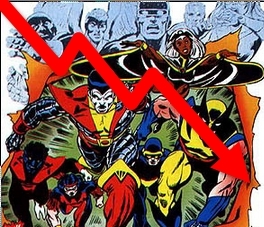 Giant-Size X-Men #1. Verdict: The books with the two highest values had white pages. But the book with the lowest value had white pages! Book with off-white and off-white-to white sold for above the median value. What’s the overall verdict? Mixed! From these charts we can conclude that page color doesn’t seem to matter; there is no evidence that white pages consistently receive the highest values. In several cases, books with less than white pages had the highest or near the highest values. Interestingly, in all cases books with cream pages fell below the median. A more precise way to test for page color is a statistical test that evaluates the difference between two population means. For this test, population 1 will consist of the non-white book and population 2 will contain only white page books. The null hypothesis is that the mean value for white page books equals the mean value for non-white page books. The alternative hypothesis is that the mean value of non-white books is less than white books. 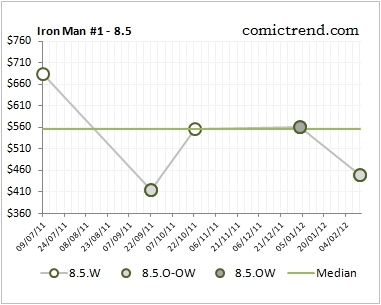 I’ll exclude Iron Man #1 because of the few observations. The test involves calculating the means of the two populations, their variance, and then comparing what’s called a test statistic against a rejection region number at a 5% level of confidence. If the test statistic is less than the rejection region then we can reject the null hypothesis that the two populations are the same. So we cannot ever say an alternative hypothesis is true, only that the null hypothesis can be rejected based on the data. If books with white pages do sell for more than books with non-white pages then the test statistic needs to be smaller than the rejection region value. 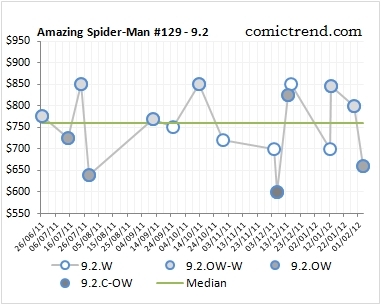 Amazing Spider-Man #238: Rejection region: -1.78. Test statistic: -0.71. No evidence to reject the null hypothesis. 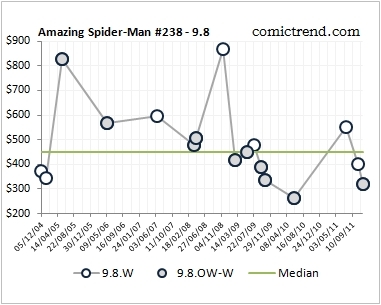 Amazing Spider-Man #129: Rejection region: -1.80. Test statistic: 0.36. No evidence to reject the null hypothesis. 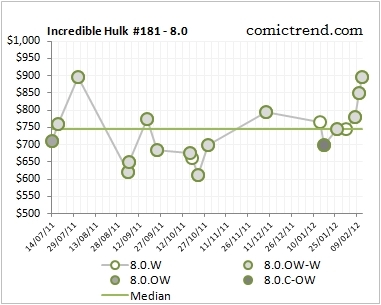 Incredible Hulk #181: Rejection region: -2.13. Test statistic: 0.44. No evidence to reject the null hypothesis. 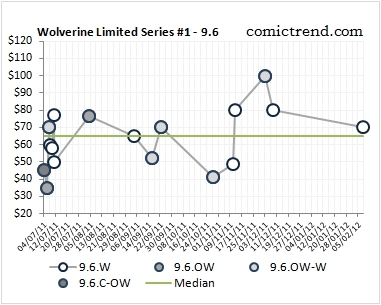 Wolverine #1: Rejection region: -1.80. Test statistic: -0.48. No evidence to reject the null hypothesis. 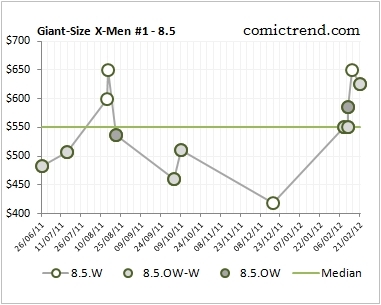 Giant-Size X-Men #1: Rejection region: -1.86. Test statistic: -4.37. Evidence to reject the null hypothesis. In four cases there was no evidence to conclude that white pages sell for higher values. The charts have been visually inspected and the test statistics have been calculated. The balance of evidence says that page color does not matter. Clearly collectors are willing to value books with off-white to white, off-white, and cream to off-white pages just as highly as those with pristine white pages. This data sample is small so any conclusions must be made knowing that a test involving hundreds, preferably thousands, of transactions could come to a different conclusion. Furthermore, given that in several cases the books with cream pages consistently ranked below the mean, further testing should be conducting zeroing in on this color. Unfortunately, the number of observations just isn’t there. I suspect that Modern Age books with high census numbers will be more sensitive to page colour. If there is an abundant supply of white page books then those with off-white pages will definitely be sold at a discounted price. Next time you’re wondering whether or not to pull the trigger on a book with off-white to white or off-white pages, bear in mind this evidence. Bid knowing that the value of the book should not be materially impacted due to its less than white pages. Very interesting stats! Now the qualitative reflections… If I was buying a fairly recent or common book in CGC 9.8, I would want white pages because if you’re trying to get the ‘perfect’ copy you might as well get the best page color as well. Many stores charge a little more for copies with white pages in 9.8. However, for all other books the page color isn’t so important – as they get older, it’s the grade that’s more relevant, and it’s to be expected they might have off-white pages, like the patina on antique furniture 🙂 However I also find the page color is a fair indicator of the whiteness of the cover, and a brighter cover is desirable in an older book if it has a lot of white in it, like Thor #151 for example. This looks amazing with a bright cover and horrible when it’s gone dull and creamy with age. So then the page color would matter. I agree with you 100% – the Modern Age books that I buy have to have white pages. I think there would be a fairly large discount (at least disproportionately so compared to Gold, Bronze, or Silver Age titles) for off-white to white and off-white books. I can’t even test the significance of non-white Modern Age titles because they don’t even trade! Good point about the covers. Page colour was never an issue for me in the past, but I think Walter makes a good point… A book graded at a near perfect 9.8 should be near perfect in every way including page colour and registration. All things being equal, I’ve been observing well centered with white pages being picked up at prices north of GPA. I guess with abundant supply, buyers can be more selective these days. As such, I’ve been letting my cream page books go on eBay and slowly upgrading when I can. I picked up an ASM#238 9.8 OW recently. I thought I might have gotten a good deal but I’m not so sure because of OW. As you say… I also expect modern books to be WHITE. Interesting point. 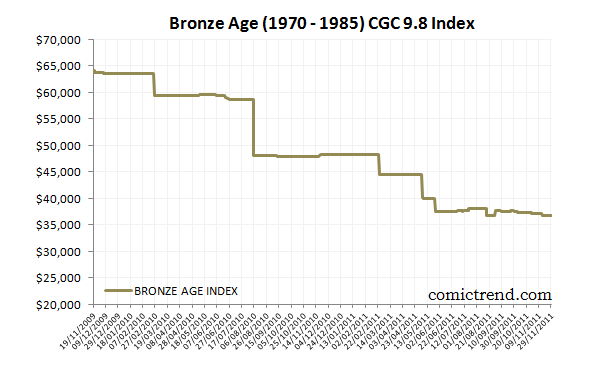 As we know, the market for high end silver/bronze has not been kind over the last few years. With these depressed values, perhaps more people are swapping out their non-whites for white pages. 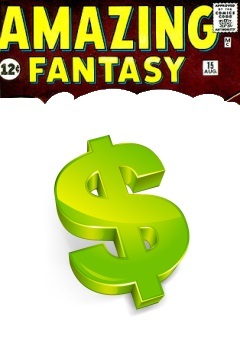 The comictrend.com value for Amazing-Spider Man #238 is $394. CGC should factor it into the grading. But once its under plastic are you really going to be admiring those white pages? More like those white edges. Sorry, thats the comic book reader in me lashing out. The reader in me tends to kick the crap out of the investor in me. Well, most of the time. 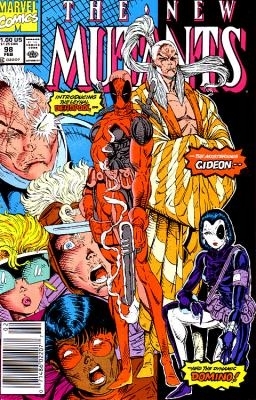 I think that for what I collect (GA and early SA) OW OW/W and W pages wouldn’t have much (if any) price differential. However if you get down to CrOW or below you do start to see discounting. Thanks for this analysis! Just what I was looking for. Am only just getting into CGC really, but when browsing eBay I keep seeing this come up. (E.g. today I found Ms. Marvel #1 in a 6.0 / White Pages and a 8.0 / Off-White to White Pages – and they are the exact same asking price. Made me wonder if one-step down in page color can really equate to 2.0 difference in grade? Obviously, asking prices could differ for all number of reasons, and with a low-value book it doesn’t take much to create this illusion. Still, interesting to see someone has done the thinking!